It appears that the narrow gauge railway in Baghdad’s Zawra Park is operational once again. Has anyone been for a ride? The locomotive seems to be a rather interesting beast. First photo I’ve seen of the defunct park railway in Baghdad. The Times had a couple of articles about passenger services in Iraq last week. In Taken for a ride in Baghdad… (13 April 2009) the newspaper’s Baghdad Correspondent, Deborah Haynes, decribes how the Ministry of Transport organised a press trip on the commuter train … but something wasn’t quite right about it. In the 29 December 2008 story In Baghdad, a Trip to Nowhere Washington Post Staff Photographer Andrea Bruce takes a ride on the Baghdad commuter train. At 5:30 a.m., everything is dark at the Baghdad Central Station. There are no passengers about, and most of the gates are still locked. The morning train, the only working train, leaves the station with a deep, heavy rhythm that vibrates through the six passenger cars. Only the engine has electricity. There are no lights. A Baghdad commute is a collection of some quite artistic photos Bruce took of the trip – it’s not everywhere people skin sheep alongside comuuter lines. Newsweek has a 19 December 2008 report A Railway’s Painful Rebirth by Jessica Ramirez. There is another video of the Baghdad commuter service – including cab views, Chinese and Turkish built locos, sheep, and motorists with a cavalier attitude to level crossing safety. 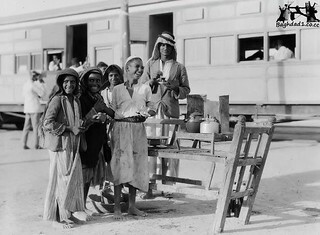 … Iraq’s railways, which came to a halt during the war, have reopened two lines in the last two months. There is now a Friday train to Samarra and a commuter train, Baghdad’s first, which makes two round trips a day between the Central Baghdad Station and the District of Dora. Railway workers consider these the first signs of progress for an industry trying to recover from the looting, murders and bombings that ravaged it after the U.S-led invasion. In a larger sense, they also reflect the long-term impact of conflict and the struggle to get a country back on track. All aboard… Baghdad’s train is a December 10 2008 NBC news video about the re-launch of commuter rail services in Baghdad. With traffic in downtown Baghdad typically a snarled mess, the old commuter train has been re-introduced to combat commuter nightmares. Ride the train with NBC News’ Kianne Sadeq as it dodges goats, cars and weaves through Baghdad. There are shots of Chinese and Turkish locos in action on the service, which was introduced at the end of October. Hopefully the system will be successful in the long term and symbolize normalcy and stability for weary residents, as well as deliver benefits to commuters tired of facing the hazards and inconveniences of road travel in the region. 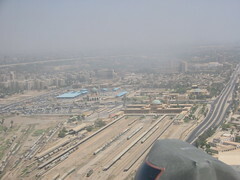 An aerial photo of Baghdad Central station taken by Antonio Edward. The Guardian of 18 November 2008 reports the revival of plans to build a metro in Baghdad, with money being set aside for a feasibility study. [On 17 November] the mayor of Baghdad surprised everyone by announcing plans for an underground train network that will literally carve a swathe through the city’s sectarian lines. If investors sign up, the world’s most violent capital will soon have a $3bn (£2bn) metro. Sabir al-Issawi, Baghdad’s mayor, said money had been set aside in next year’s budget for a feasibility study. And if that goes ahead, the Iraqi government has earmarked funding that it claims could build most of the two mooted train lines without private help. Even the country’s eternal optimists were last night calling the plan ambitious, but lauding its audacity. One of the new proposed subway lines would run 11 miles from Shia-dominated Sadr City in the east to Adhamiya in north Baghdad. The other would traverse 13 miles and link mixed central Baghdad to the primarily Sunni western suburbs. The project’s engineer Atta Nabil Hussain Auni Atta, of Iraq’s transport ministry, said old 1970s blueprints for the underground line were being redrawn to bring it up to speed with the specifications of modern railways. Phase 1 Line 1 north to west Thawra (depot)/Sadr City – Aadhamiya 32km 36 stations. One metro line would run 18 kilometres from the far side of the eastern Shiite slum of Sadr City to the centre of the city and then up north to the mostly Sunni Adhamiyah neighbourhood, covering 20 stations. The second line, extending 21 kilometres, would start in the south and pass through the central commercial district of Karrada before crossing the Tigris river and running out to the mostly Sunni neighbourhoods in west Baghdad.